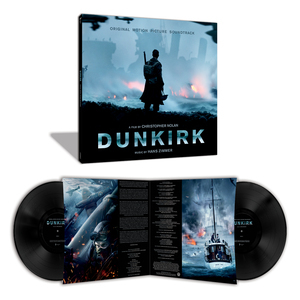 WaterTower Music is pleased to announce the release of the double vinyl soundtrack to acclaimed filmmaker Christopher Nolan’s epic action thriller Dunkirk is now available. The album features an original score by Academy-, Golden Globe-, and Grammy Award-winning composer Hans Zimmer, who previously collaborated with Nolan on the director’s Interstellar, Inception, and The Dark Knight Trilogy. The double vinyl set of the soundtrack has now become available along with the digital and CD versions of the album. The Dunkirk soundtrack features a powerful and unique score unlike anything produced before by this formidable and inspired artistic pairing. From filmmaker Christopher Nolan comes the epic action thriller Dunkirk. Nolan directed Dunkirk from his own original screenplay, utilizing a mixture of IMAX® and 65mm film to bring the story to the screen. The film’s ensemble cast includes Fionn Whitehead, Tom Glynn-Carney, Jack Lowden, Harry Styles, Aneurin Barnard, James D’Arcy and Barry Keoghan, with Kenneth Branagh, Cillian Murphy, Mark Rylance and Tom Hardy. The film was produced by Nolan and Emma Thomas, with Jake Myers serving as executive producer. Warner Bros. Pictures presents a Syncopy Production a film by Christopher Nolan, Dunkirk. The film will be distributed by Warner Bros. Pictures, a Warner Bros. Entertainment Company. This film has been rated PG-13 for intense war experience and some language. Even though I never got this score, I am still pushed to giving it a shout out for it as it represents a important film... and music by a grand composer. Powerful soundtrack for a powerful movie.